The City of Light shines at Christmas, with decorated streets and shops, Christmas markets, special events, activities and shows, and all the magic that makes Paris the art capital of the world. 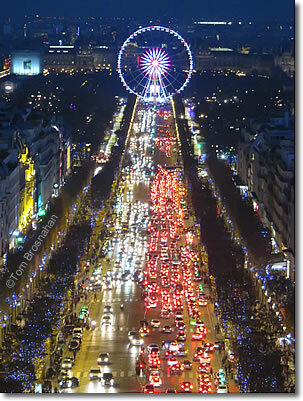 In Paris at Christmas, the Avenue des Champs-Élysées glitters with twinkling lights, the great department stores outdo one another with stupendous decorations, outdoor Christmas markets dot the city, the Roue de Paris, a gigantic Ferris wheel 60 meters (200 feet) tall looms above the Place de la Concorde and—surprisingly—streets and public transport are less crowded and frenetic than in the summer months. Many principal sights, such as the Arc de Triomphe, are open longer hours than usual. Although the throngs at the department stores and at the Cathédral de Notre-Dame are larger than ever, many other Paris attractions are less crowded, and between Christmas and New Year's some shop, restaurant and other business owners take a fermeture exceptionnelle (special closure), lock their places tight, and go off to spend the holidays with friends or relatives somewhere else. This exodus of Parisians is probably why the Métro, buses and sidewalks are less crowded than in the tourist-thronged warm months (except for August, with its fermeture annuelle—summer vacation). But Paris is Paris, with art, music, ice-skating, river cruises, café-sitting, restaurant dining, shopping and special activities. The weather may be rainy and chill or sunny and mild. During our 2015 Christmas-in-Paris trip, the sun was out most of every day, rain showers were few, brief, and mostly at night, and high temperatures reached the mid-teens Celsius (mid- to high-50s Fahrenheit)—delightful weather for walks, tours, bicycling and even café-sitting (in the sun). Prices can be higher for short periods and some treats—dinner on New Year's Eve, La Fête de Saint-Sylvestre, but in general hotel and restaurant prices are not as high as summertime, shops and department stores may offer holiday bargains, and special dispensations such as free public transportation on New Year's Eve, help your budget. And, as always, there's lots to do for free in Paris. We spent hours wandering through the Christmas markets, enjoying the decorations and the offerings, without buying a thing. We also enjoyed strolling in different neighborhoods in the evening and seeing the variety of Christmas lights around town. The department store windows offered a variety of decorations, including many animated scenes. And the interiors of the stores were also beautifully decorated. Some churches display special creches at Christmas time, and of course Midnight Mass on Christmas eve at Notre-Dame and other churches is also very popular. We rang in the New Year on the Pont des Arts, along with crowds of French people, most of whom were equipped with champagne and real glasses to toast at midnight. Getting home after midnight was easy, as public transportation was free all night. Above, The Avenue des Champs-Élysées and the Roue de Paris Ferris wheel as seen from the top of the Arc de Triomphe. 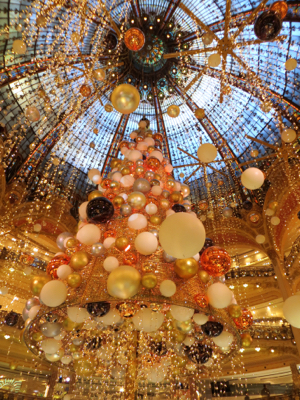 Below, Beautiful tree under the stained glass dome of Galeries Lafayette.